This coming Tuesday evening, the 16th, we will meet at St. John’s Church Hall at 7:00 pm. We have two very important items on the agenda this month: the proposed Holiday Home Tour guidelines and a presentation from David White on his proposed Pear Street Development. 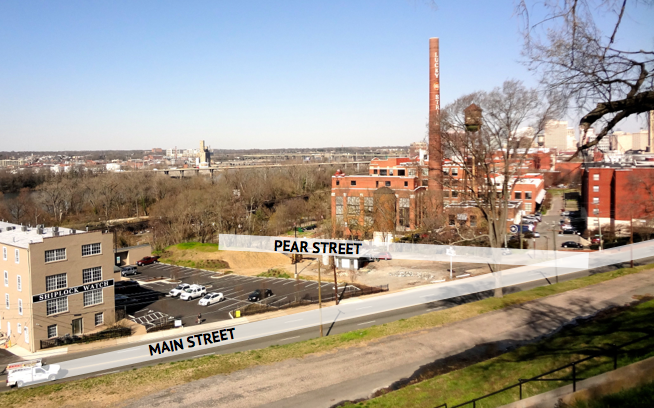 The Proposed Guidelines may be reviewed here and information regarding the Pear Street development may be found here and here. We look forward to seeing you at this important meeting! Additionally, the minutes for the March membership meeting and April board meeting are posted on the website. They can be found in our Communications section. Mr. White seeks to develop a landmark, high-end condominium project. The building is proposed at 15 stories above ground & three stories of below ground parking (below ground at Main Street, above ground at Cary Street). Under the proposal designated parking would be below Main Street & carved into the existing topography with a living wall to mitigate any potential eyesore. Mr. White is sensitive to the viewshed & the perceived historic view from Libby Hill Park. Mr. White has consulted with Historic Richmond Foundation regarding the view. Mr. White believes an impact to a “secondary” view will exist if the proposed project is completed to his design specifications. The proposal calls for a glass, brick & mortar building 150 tall from the base of Main Street at Pear Street. The building would house 37 condominiums, 15 of which would be three bedrooms plus a den with 3 & 1?2 baths per unit; with the remaining units being two bedroom units. The units would be priced from the mid-$400,000s to $1,300,000 & range in size from 1,600 to 3,300 square feet. Concept One: Proposal calls for a building 110 feet tall from the base of Main Street at Pear Street constructed of brick & glass. The impact to the view from Libby Hill Park was discussed. It was deemed this proposal while it would impact the view would be less conspicuous than the original proposed design. The new proposal calls for removal of 20 feet from the penthouse level (two stories) & 30 feet (three stories) from the podium (mid) level. The new concept would still have views of the James River west to downtown, east to Rockets Landing & of Libby Hill Park. Concept Two: Proposal calls for a building 100 feet tall from the base of Main Street at Pear Street constructed of brick & glass. The impact to the view from Libby Hill Park was discussed. It was deemed this proposal while it would impact the view would be less conspicuous than the original proposal & less than concept one. The new proposal calls for removal of 30 feet from the penthouse level (three stories) & 30 feet (three stories) from the podium (mid) level. The new concept would still have views of the James River west to downtown, east to Rockets Landing & of Libby Hill Park. Mr. White further advised the committee he also has the opportunity to build a high- density apartment building, similar to the Tobacco Row developments. However, this is not his intent at this time and would require the property be rezoned to B-5 from M-1. Adjacent developments are currently zoned B-5. Committee response & discussion: A significant opportunity exists with this developer & his vision for this site. It was agreed that the opportunity should not go unlooked at & that the CHA has real potential to work together with Mr. White to shape the design of the riverfront. It was noted that should CHA oppose the development outright the developer has the potential to either seek to build to his desires, or to sell the property at which point the site could see similar infill development which currently exists in the area. wait, these are going to be condos for sale? not rental units? If they are for sale right away, doesn’t that mean they won’t get tax credits? doesn’t make sense from a development standpoint, I don’t think they are being straightforward. and btw, David White’s partner in Historic Housing is Lou Salomonsky–is he going to bribe any city council members to get what he wants? Clay Street, this is a completely new building and wouldn’t be eligible for tax credits anyways. ahhh yes, you are right:) didn’t read closely enough. Something that would be excellent is a section cutting through Libby Hill, through the proposed building and all the way down to the river. This would give everyone a true sense of the building’s scale, rather than having everyone imagine what may or may not be built. The extreme slope of the site is definitely a great thing, as the builder said it could hide a lot of parking and could even help it to appear shorter from the Libby side. On a slightly different subject maybe some improvements will be made to the Pear/ Main st. intersection which can be a little tricky to negotiate at times. That’s going to stick out like crazy. Sounds like developer is basically threatening CHA as well. These things won’t sell for a long while at that price. River Lofts tried selling the town homes in front of Lucky (~2200 sq ft, 3BR if I recall recall correctly) for about that at the peak of the bubble with no takers. This clown wants to come in and build a skyscraper right next door and thinks he’ll get at least that on his lowest priced a few years later? Anyone have any idea how tall the Lucky Strike smokestack is? I was in Libby Hill park yesterday and looked down and wondered how this building would compare to that. And to #5 BAC, I completely agree about that intersection. It’s a pet peeve of mine that people come flying into town going fifty miles and hour. When Tobacco Landing, the building on the other side of Main from Poe’s, was in the planning stages, I went to a planning commission meeting and was told they were going to do a traffic study but apparently nothing happened. I’d like to see another stop light somewhere down there, probably at Pear Street. Oh okay they want to ruin the view of our city with an office building and they’re doing us a favour? Check out any of the new construction from this company and the majority consists of vinyl siding and windows. Anyone lamenting the benefit of this project who no one has even seen should be questioned. Hey guess what this IS a test run for Echo Harbor because if it is allowed any monstrosity will be approved. good question. The Lucky Strike stack is 243′ tall. A good visual reference point for the newest proposal is the water tower near the smoke stack. The height of current (lowest) proposal is just below the hood of the water tower roof. Did Mr. White write the above intro.? At the CHA meeting, Mr. White began by stating that the City of Richmond is broke and this project is practically a done deal because the taxes it would generate would save the City. Waite Rawls attempted to filibuster, eating up time that the membership could ask questions. However, Mr. White made it clear that he was not seeking input from the CHA and was not interested in compromising his plans for this construction project. He does not need nor seek our approval. The slide show was carefully prepared to minimize the impact to the view from Libby Hill Park and was deceptive to say the least. Mr. White is of the opinion that the CHA is a negative organization which opposes any and all “progress”. To use a quote from Bill Clinton, it depends on what your definition of progress is! Mr. White made the most ludicrous statement of the evening when he stated with great certainty that his project would in no way open the door for future high rises along Main St. like Echo Harbor! What could have been a contentious meeting was run very well and with dignity. When leaving the meeting, Mr. White was being interviewed by Channel 6 which he had invited to the meeting. I am of the opinion that this project should be vehemently opposed for the following reasons. !. A high rise below Libby Park WOULD impact the view shed. Mr. White talked a great deal about “roof top gardens” and ” greenery cascading from balconies “. Why? Because contrary to what he SAYS, he knows that this high rise would not enhance the view from Libby Hill! 2. This project would most certainly open the door for Echo Harbor and other projects along Main St. This so called presentation at the CHA meeting reminds me of the gentile southern family that had a horse thief in the family that was hanged for his deeds.i However, the families version of events was that their famous relative was at a large gathering being honored for his deeds and unfortunately the stage collapsed killing him. @11 – thanks for the summary. Sounds like this Mr. White is a real piece of work. Let’s hope he is wrong about this practically being a done deal. Sadly, since it’s Richmond, it probably is as long as he has either enough money to throw around or is connected to the right folks. I don’t think most of us up here are opposed to new development in theory, it’s just that all the developers seem to be proposing such hideous stuff. Tip to developers, if you want to build a big development, buy a decent amount of land to go with it. Higher only works downtown. Has anyone figured out who is the target audience for a million dollar condo tucked between a loud stretch of the train tracks, a lower end apartment community that rents for $700 a month (Tobacco Landing), Poe’s Pub and the bottom side of a hill? Damned if I know what so “iconic” about it but whatever it is it’s certainly a hell of a lot less “iconic” than the view from Libby Hill Park that he intends to spoil.. I was also at the meeting. I, too, am concerned about the height of this building and the visual aspect of how it does or does not fit with what is already down there. The architect stated more than a few times how the apartments there were boxy, flat, etc. – not a complimentary stance by any means. I lived in the Tobacco Row apartments for a year while deciding where we wanted to live in the city (my husband and I now live in Church Hill). I was mildly offended when his comment of “we want to appeal to people like us” implied that the residents of these apartments are somehow less desirable? I was one of them! I can also say that the majority of the tenants we encountered were young professionals who wanted to live in the city but could not yet afford a house or, like us, were contemplating where to buy. There was also an interesting written 3-page “statement” authored by Mr. Rawls that stated his opinion of why this should go forth. It ended with a statement saying, essentially, that he would support this proposal if the developers announced their opposition to the stadium in the Bottom. Mr. Rawls was called out on this during the meeting and his statement was that it was his personal opinion, not the opinion of the Zoning Board. Interesting…..smacks of backroom deals to me. And yes, I agree with Jean – he was not there to seek our approval. Alex, In addition to all the items you so rightly pointed out, you forgot to mention that the sewerage treatment plant is just across the river. Mr. White says these condos are going for over a million dollars. I would not spend that kind money if I had to smell the sewerage gasses when they are vented. As for the target audience, Mr. White stated that he already had buyers lined up? Again, I think it would be in our best interest if we oppose this project as vigorously as possible. I do not think this is a done deal!! As you will recall the revelation that Echo Harbor’s financing was coming from the Moonies was dug up by me. I have decided to go into investigative mode on this project. If anyone has a specific skill that would be helpful and would like to join in this effort please contact me . Any and all suggestions are welcome and would be appreciated ! These “buyers” should be made aware of these little drawbacks. Echo Harbor could not operate in the light of several disturbing revelations. Karen, I think it was Mr. Rawls and not the architect who made the “people like us” comment. I was offended by it as well. I also find quite “enlightening” your observation that Mr. Rawls is, in essence, trading his support for this monstrosity in return for Mr. White’s opposition to a stadium in the Bottom. WOW! My apologies to the architect – you are correct – he did not make the statement about “people like us” though the comments about the appearance of the existing apartments were the architect’s. 1. Waite wants to swap a ballpark that all of us could benefit from having for a monstrosity that hurts everyone? Can we make the opposite trade please? 3. It wouldn’t surprise me if these price tags are way inflated from where they’ll actually sell just so they can show the city a rosy picture of potential real estate taxes. 4. Having a ballpark might actually make this project make MORE sense. That way there’s something to do in Shockoe Bottom besides getting drunk, shot or robbed. The RVB group is looking fro pictures of the view with emphasis on southerly and western perspectives.